New Han Solo Set Photo Teases a Return to the Death Star? We still have no idea if Disney and Lucasfilm are going to be able to clean up the mess that is, or at least was, the untitled Han Solo movie, but director Ron Howard is doing a bang-up job of trying to calm nervous fans. Howard has been very active on social media ever since taking over on the latest Star Wars movie, but he has been teasing quite a lot without giving much away. His latest set photo could be his biggest tease yet as it seems to indicate that the dreaded Death Star could be featured in the Han Solo movie. The official Ron Howard Twitter posted the latest Han Solo movie set photo to his Twitter account and Star Wars fans will be quick to recognize the imagery. The photo features a swooping black helmet placed over a familiar looking control panel. 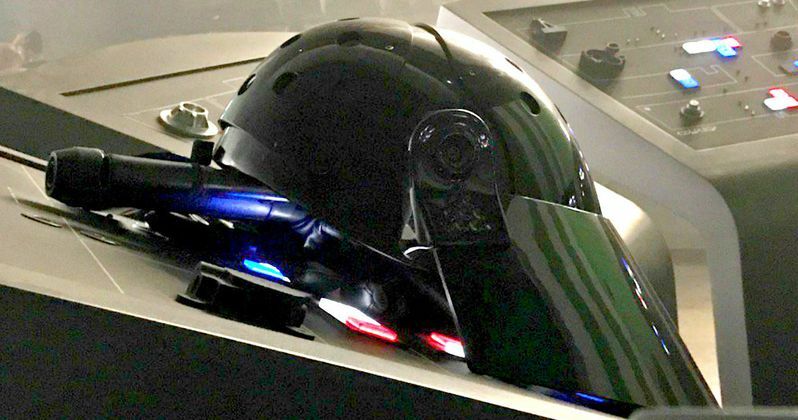 The helmet is very distinctly the Death Star troopers in Star Wars: A New Hope and, more recently, in Rogue One: A Star Wars Story. Also, given Ron Howard's accompanying caption, it seems pretty clear that he is teasing that, in some way, shape, or form, we are going to see the Death Star in the Han Solo movie. This is a big potential tease, but one that may come with a groan from Star Wars fans. Having the Empire's presence felt in a big way in the Han Solo makes perfect sense. The movie takes place roughly ten years prior to the events of Star Wars: A New Hope. But the Death Star has become something that may be a bit overused. The planet-destroying weapon has made some sort of appearance or another in nearly every single Star Wars movie so far. Even Star Wars: The Force Awakens just used a bigger Death Star as a key plot point, even though they called it Starkiller Base. Do we really need to see it again? It is also worth noting that Han Solo first learned of the Empire's super weapon in the original Star Wars. Not to say that another character won't be how we see the Death Star in the Han Solo movie, if that is indeed what Ron Howard is alluding to, but this is a Han Solo movie. So why feature it at all? Maybe the story will justify it and, since we know very little about the movie at this point, that may very well be the case. Rogue One very successfully managed to give us a whole lot of Death Star action, so we really don't need any more right now. In any case, we can't definitively say that is what Ron Howard is teasing here, but it seems likely. Still, after Phil Lord and Chris Miller were fired just weeks before production was scheduled to wrap, he has managed to make things surrounding the Han Solo movie feel a lot more positive. Assuming Disney and Lucasfilm stick to the May 25, 2018, release date, and that is what they are saying, we should be seeing a trailer, or at the very least be getting a title reveal for the Han Solo movie soon. In the meantime, be sure to check out the new set photo for yourself below.